There’s a new pizza restaurant in Wailea, located at 100 Wailea Ike Drive. If you think that address sounds familiar, it’s because that spot used to be Matteo’s Pizza. They operated there for about six years before closing last April. But if you think Manoli’s is just picking up where Matteo’s left off, you’re wrong. Owner and operator Aaron Placourakis has the makings of a restaurant empire on Maui with Sarento’s, Son’z and Nick’s Fishmarket, as well as other restaurants on Oahu as well. Manoli’s is his venture into casual dining, and his approach is entirely gourmand. Still, it’s “designed with family dining in mind,” he says. Placourakis named the restaurant after his father (and son), both named Manoli. His dad was raised on Crete and inspired much of the artisan menu featured at this new Wailea spot. 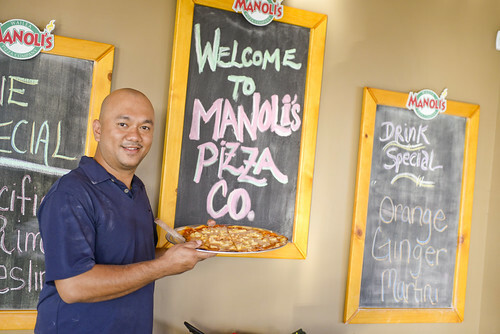 To show their commitment to the family and community, Manoli’s Maui ran a social media campaign where they awarded the winner free pizza for a year. 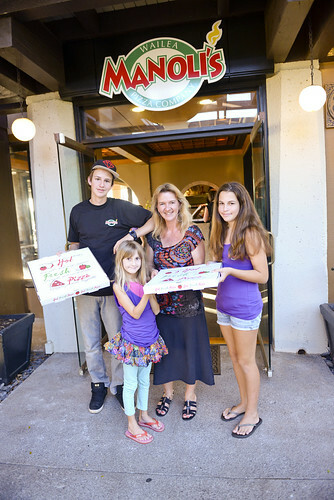 The lucky winner was a business owner in the Wailea area with three kids who was thrilled and says her family loves the pizza there. Given that the kids menu is all-you-can-eat cheese pizza or spaghetti with a drink and dessert up to age seven, all priced at your kid’s age plus 99 cents, family dining here is a no-brainer. One of the first moves Placourakis made was to knock out some walls and build a bar that overlooks the gardens and ponds. 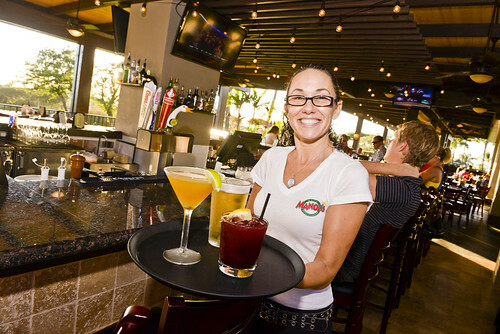 Now Manoli’s is host to an early bird (3-6pm) and late night (9-12am) happy hour where Mai Tais, wells and domestic brews start at $3. Happy hour also has a nice pupu menu; pizza by the slice is $2 and so is the meatball slider, with a range of other items priced $4-7. The restaurant is open-air, most of the seating faces out to the ocean and the sunset view is spectacular. But it took me a few visits to notice all that because I was all about the food. The first thing that struck me on the menu was that their handmade artisan crust comes two ways: gluten-free and organic wheat. I couldn’t resist putting them to the test on a gluten-free crust–not because I have diet restrictions but because it’s so hard to get the texture right. Their gluten-free dough does the trick, and is light and chewy at the edge but still supports the cheese in the middle. The sauce is their organic house-made Pomodoro, which is tangy and sweet–just right with the Margherita and the Mediterranean I ordered with the organic wheat crust. Then there’s the garlic bread. Though it’s not gluten-free (sorry celeriacs), it melts in your mouth. It has great flavor and is the perfect bed for the cheese topping they melt over it. The shrimp Scampi pupu is also a surprise. 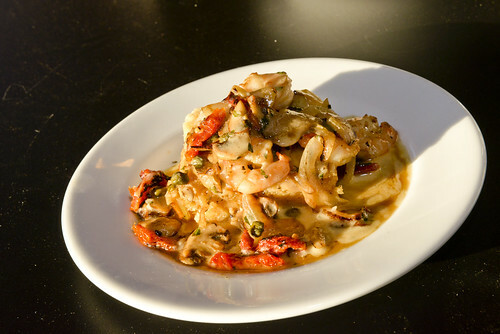 Their Scampi has a perfect buttery wine sauce with shrimp that douses crostini. They also have pastas, gluten-free pastas and organic salads. Manoli’s also has a great wine list and they carry Maui Brewing Co. beer on tap. Oh, and save some space for their sweets: the gluten-free banana cream pie is to die for and their Tiramisu is house-made.